[ ] 3. Remove old decals and artwork from the cabinet sides. Clean off glue residue. Fill gouges, unused holes, etc. with quick-hardening wood putty. Sand smooth and remove dust. [ ] 4. Evenly cover the entire cabinet with black paint. Allow the paint to dry completely before continuing. [ ] 5. Pencil a line roughly at the top of the previous graphic. Lightly moisten the cabinet with soapy water. Remove the backing and apply the decal. Start at the top and work down. Working outward from the center of the decal, smooth down the decal. Take care to squeeze out air bubbles. If you can't remove a bubble, pop it with a knife or pin. Allow at least 12 hours for the adhesive in the decal to set. [ ] 7. Remove the viewing glass and set it in a safe place. Clean the CRT and monitor bezel. Locate the player moves and game-play instruction decals. Apply them to the top and bottom-front of the monitor bezel. Find the epilepsy warning label. Place this label on the top-front of the monitor bezel. Be sure that decals and labels don't obstruct the viewing area Don't reinstall the viewing glass yet. [ ] 8. Remove and save the screws at the top and sides of the rear door. Unlock the rear door, and then lift it off of the cabinet and set it aside. Cover the VGM electronics. Use a vacuum cleaner to remove dirt or debris from inside the cabinet. [ ] 9. Compare your player control panel to the player panel template. If the player panel and template match, then skip to the next step. Otherwise, proceed with the rest of this step. Locate the player panel latches or fasteners. Free the player panel from its operating position. Separate the control panel's earth ground (green) wiring from other control panel wiring. Cut cable ties as necessary to achieve this separation. Leave the earth ground (green) wiring in place. Disconnect and remove the remaining old wiring from the CPU Board and player controls. 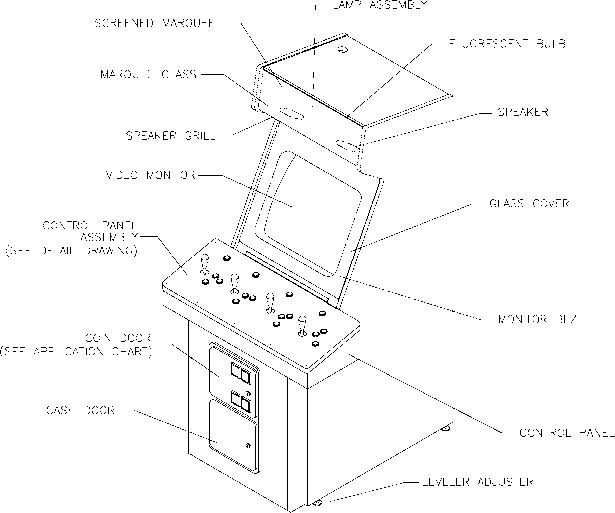 Remove the player panel and housing from the VGM cabinet. Save the mounting brackets and hardware for reinstallation later. [ ] 10. 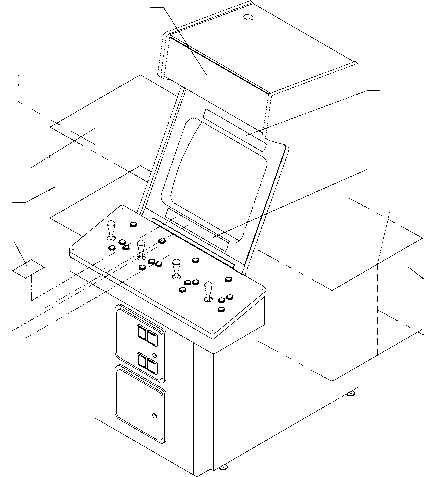 Some cabinets have speakers on the player panel or other removable pieces of the cabinet. If you must disconnect speaker harnesses, mark the polarity and functions of the wires. Incorrectly phased speakers can cause weak low frequencies or a thin, hollow sound quality. NOTICE: FCC COMPLIANCE. Installation of this kit into any existing product does not guarantee compliance with FCC requirements. 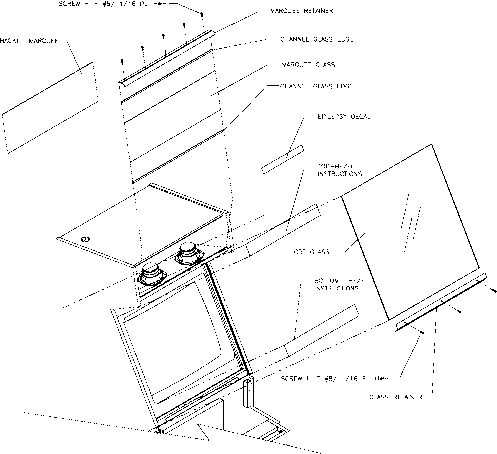 You are solely responsible for FCC compliance for installations in other products. You must remove any existing FCC compliance label. Don't install a new label on the converted product until you have verified FCC compliance. [ ] 11. Unfold the cardboard marquee header from your kit. 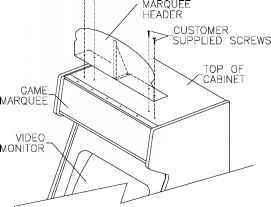 Make sure that the triangular brace supports the middle of the marquee. [ ] 12. Install the marquee header on top of the marquee. You must supply the four wood screws necessary for fastening down the marquee.